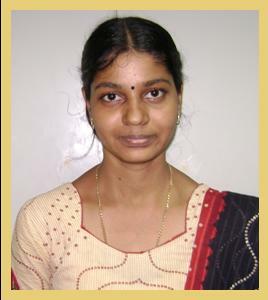 Ms. Rajaeswari Yogamalar completed her Masters in Physics from The American College, Madurai in the year 2007. She is pursuing her research work in the area of metal oxide nanomaterials under the supervision of Dr. A. Chandra Bose. One year project work on 'Mapping of Educational Institutions in Madurai City using Macromedia Flash MX2004' in Lady Doak College, Madurai. One month project on 'Effect of radiographic parameters on contrast sensitivity and defect detectability' in IGCAR, Kalpakkam. Six month project work on 'Controllable Growth of ZnO nanostructures by citric acid assisted hydrothermal process' in The American College, Madurai. Formation mechanism of ZnO nanorods by low temperature assisted hydrothermal process, National conference on nanomaterials, Karunya Univ., Coimbatore.